Another of the lost travelogues – a thrilling escape from the clutches of Las Vegas, only to fall under the spell of an exotic temptress. And, in case you missed it, here’s part 1. I recently recovered some old documents and discovered a trove of trip reports. This first one is ostensibly about a trip to NAB (National Association of Broadcasters) but is in reality the ramblings of an alien in search of oatmeal in a foreign land. Please enjoy NAB – First Ascent. 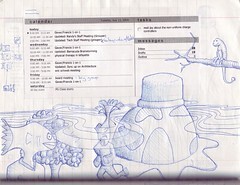 I like to look at my old meeting doodles now and then. I especially like the task on this page “mail jay about the non-uniform charge controllers” – that must have been for the flying saucer. We arrived last night despite being held hostage on the tarmac for 45 minutes by American Airlines. Stopped along the way in Islamorada for dinner in the worlds windiest restaurant. The menu included deep-fried Dolphin, grilled Dolphin, Dolphin sandwich, and Dolphin sashimi. We were much relieved to learn that “Dolphin” is the local name for Mahi Mahi tuna. The place is quite nice. There is a bit of a Sargasso growing around our jetty, and when the tide is out you can smell the old grass rotting. The view makes up for the knee-deep muck and there are plenty of local places to get in the water for snorkeling, so we’re not complaining about that. The pool is 85 degrees, so Mori and Julie should be quite happy here. Jiro, the DSL service is unbelievably slow here. Maybe you can do a CO diagnostic and see if there’s a problem with the line. We’re having english muffins for breakfast, fresh bananas, and coffee or orange juice as appropriate. Drive due East from California, turn right when you hit the Atlantic and continue following the coastline until you get to Big Pine Key, Florida. We spent the afternoon in Key West, the end of the road. If the United States are Glass Beach, then the keys are the spot where all the over-tanned, leathery, flotsam collects. I’m not sure if they all worship Jimmy Buffet, but they all dress like him and sit at the bar just he does in his songs. There are drive-through liquor stores and walk-up bars where you can get margaritas in to-go cups, and two sandal stores on every block. We watched the sunset with five hundred other people and it was just spectacular, exactly as promised. Took a walk (had to hop a fence) this morning to an old quarry I spotted on the satellite map of our island. Something very spooky about the deep green water and machine-cut jagged edges of the pool. It’s almost like we expect only the scary creatures to fill in the holes that we make in the landscape. I found a couple of moulted horseshoe crab shells around the perimeter, and some colonies of almost transparent mussels, but no sign of any monsters from the deep. In an effort to overcome the last of our jet-lag, we’re up at 8:30 this morning. It doesn’t take long in the tropics to start to feel like making breakfast is a big accomplishment. This probably accounts for the fact that there are few famous centers of innovation in tropical climes. We’ve decided to acquire a kayak for the duration of our stay. We are here just long enough that renting one is more expensive than purchasing a used one – which brings up the interesting question of what to do with a kayak when we leave. It’s not like we can check it through at the airport. Took the tour of Hemingway house yesterday. Saw the descendants of his polydactyl (many-toed) cats. Then we watched “Key Largo” with Humphrey Bogart, Lauren Bacall, Edward G. Robinson, and Lionel Barrymore. Spent the morning rediscovering my lost rope-splicing skills. Quality of my splices greatly improved with the use of a makeshift fid – the closed pliers of my Leatherman. After some muddling around, I managed to the get the kayak in the water and paddle two and half miles upwind to the White Ibis colony just around the other side of Big Pine Key. Turned back when the wind was more persistent than I, only to meet it head-on at the bridge again as I made my way upwind to home. Upwind both ways, thanks to a little squall that came through and dumped half a cup of water on me as I hauled the boat out of the water at our dock. Paddled out to Big Mangrove Key this morning (are you following along on your maps?) for a circumnavigation of the uninhabited atoll. Quickly discovered that if you paddle like you want to get somewhere, you miss everything along the way and soon settled into a very leisurely pace that took advantage of the tidal flow and morning breeze. Discovered mysterious and unusual creatures, many of which have never been seen before by human eyes. At almost one half of a mile from the nearest human outpost, the little key has only ever been mapped by satellite. As I skimmed over the skirt of Sargasso grasses and small sponge-forms, I was filled with both trepidation and glee. What primitive monsters lay in wait? What shoals of natural gemstones? What lost civilizations? I saw a seabed littered with what looked like cheap brown crockery, only to discover, on closer inspection, that what looked like bowls and cups were actually sponges. Upside-down jelly fish bask in the shallows exposing internalized colonies of chlorophyll-laden organisms, pulsing gently in the sunshine. Uncountable schools of tiny fish scoot around like living shadows. Tenacious mangroves reach down from ridiculous heights to find support for their out-reaching branches. Upon first arriving in the Keys, I was somewhat cynical about the decaying evidence of all the failed schemes put into play by dreamers who saw this as a place to make their mark. What they didn’t realize is that this place doesn’t require anything, from anyone. As the years go by, they inevitably give up their grand scheme, not for lack of trying – there is evidence here and there of some amazing efforts expended – but because the islands here are patient in their persistent lack of expectation. Not only is it ok not “do” anything here, it’s appropriate. This would be a tough place for me to live. Not because it’s hard to live here, but because it’s too easy – you slip effortlessly into a zen-like state of acceptance and then not only don’t realize you’re not doing anything anymore, you actually don’t need to do anything anymore. My first response is to create bite-sized projects for myself – tonight I built an aquascope so that I can see better into the water over the size of the kayak. I am daily more impressed with Hemingway, who managed to write six books while he was here. He did it three hundred words a day on a manual typewriter – clackity clack. I’m afraid of the dark. I’ll admit it, I’m not ashamed. It’s a symptom of having an overactive imagination. Every dark pool of shadow hides unknown possibilities – all of them… dark. It is normal for me to run from the studio to the house when I am done working down there. You see, the forest that I know so well during the day, becomes something sinister and mysterious at night. So, it was with some trepidation that I volunteered to take the garbage out to the dumpster at the end of the driveway this evening. This undertaking would require me to walk down a long, curving driveway, losing sight of the house almost as soon as I departed. But, partly for an excuse to be alone, I bucked up and grabbed the bag before anyone else could offer to come along. As I walked down the asphalt, a thought occurred to me – where do you put a leach field when you live at sea level? The woods that line the road are actually rooted in water. The only reason the house and road are not in water is that they pile up crushed coral to create the roadbed and foundation. So, I decided, the leach field must be under the road. Which got me to the dumpster. Which is when I realized that the only thing I could imagine coming out of the woods here are those tiny Key Deer. Which is exactly when one walked out of the woods, crossed the road, and ducked into the mangroves on the other side. Put the kayak in at the end of Blimp Road on the North side of Cudjoe Key and paddled upwind to the lesser-traveled parts of Knockemdown Key. These Keys have not been beset by the sea-grasses that are choking Big Pine Key. The locals tell us that it happens every couple of years, but that the winter storms can usually be counted on to clear the grass out. I would like to be here for a hurricane. I saw a refrigerator door in the upper branches of a mangrove on one of the uninhabited keys Jennifer and I paddled to yesterday. That’s a real storm than can tear the door off a refrigerator. Blimp road is named after the Aerostatic Blimp base that the Navy has established on Cudjoe Key. According to the guard at the gate, it’s used for long-range radar surveillance. Julie and I assume that means they are keeping an eye on Cuba. The “aerostatic” part comes from the fact that the blimp is tethered. I have driven down Cutthroat Drive, and past Cut-toe Drive. There is both Brigand Place and Brigand’s End. The No Name Pub is on No Name Key, and today I chatted with a guy who lives on Little Knockemdown Key in a cluster of four homes, two of which are vacation homes which the owners pretty much never use. He’s lived here in the Keys for all of his 58 years, and on Little Knockemdown for the past 23. He doesn’t own a car since Little Knockemdown can only be reached by boat. They collect rainwater in a thousand gallon cistern because there is no fresh water on his Key. His wife likes to read romance novels. There is, in fact, no source of fresh water in any of the Keys ever since hurricane Wilma pushed salt water into the Blue Hole on Big Pine Key. Hence, there are no wells on Wells Key. The newest condo development is called Parrotdice, and today as I drove home from kayaking, I noticed a “now open!” sign for the Pirate Wellness Center. It’s late. We have to be out by 10am tomorrow, and we haven’t packed yet. We saw a giant sea turtle today, huge squadrons of angelfish, took a ride in a glass-bottom boat, and watched in fascinated horror as an alligator caught and ate a turtle – the sound of the crunching alone with stay with me forever. I used to use Tumblr, which for the record is a great variation on the blog concept, but I was ultimately frustrated by the lack of comments, traffic reports, or stylistic control. I had considered porting all of the postings over there to here, but didn’t find the time.